Baby Shakes are a rock n’ roll-punk band from New York City. Mary on lead vocals and guitar, Judy on lead guitar and vocals, Claudia on bass and vocals, and Ryan on drums. With catchy melodic vocals over dirty guitars and a killer rhythm section, their influences range from The Ramones and Slade to Chuck Berry and 60’s Motown girl groups. Formed in 2005, they’ve released 5 singles, a 10” heart-shaped EP, a singles collection, and 3 full length albums. They have toured the US, Japan, China, Ireland, UK and Europe. Baby Shakes have shared the stage with The Romantics, The Boys, Shadows of Knight, The Undertones, Buzzcocks, Barracudas, Protex, Black Lips, Paul Collin’s Beat, Derv Gordon (The Equals), Iggy Pop, among others. 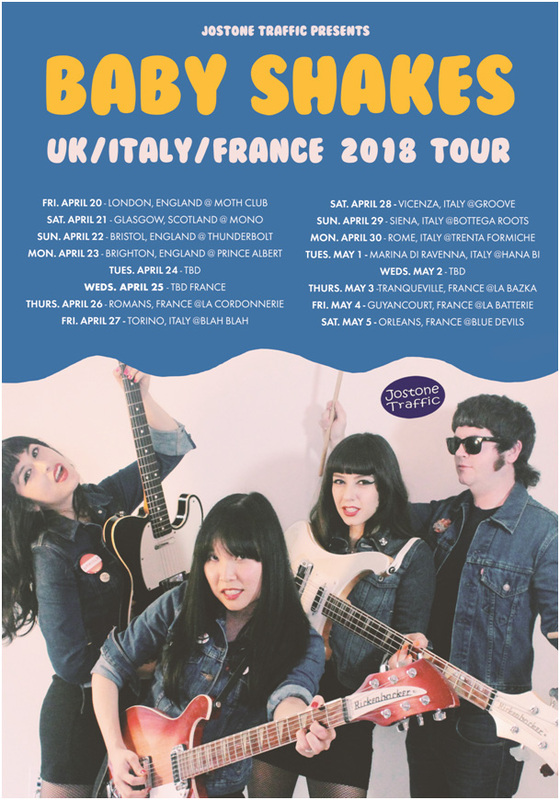 Baby Shakes just released their third full-length album, titled Turn It Up, in May 2017 which will be followed by a US & international tour.